Wowee wow wow! What a stunner this polish is! And I've got to say I'm loving this mani! Glam Polish - Interstellar was purchased from Rainbow Connection. It's a milky white base full of neon pink and blue glitters and... silver stars! So fun and so very girly! It would be perfect for a babyshower! 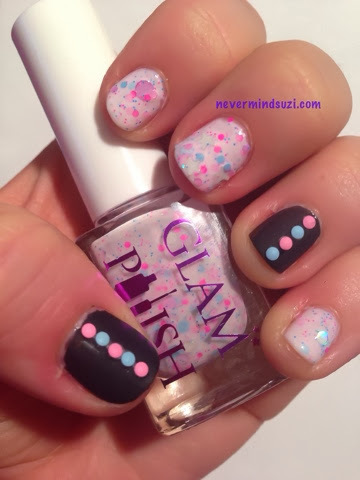 My ring and accents Essence - Black is Back with the OPI Matte Topcoat and some fabulous neon pastel studs that I bought here from Born Pretty Store. These studs are easily applied with a bit of extra topcoat and lasted all day.